Day 34 of the food challenge! Less than two more weeks to go and results continue to be amazing for our friends and family. I had a dish similar to this at a cute little cafe in Long Island City called BreadBox. It doesn’t sound very paleo but they have some great breakfast options. This one in particular is a favorite for my husband and me. It reminds me of an amazing breakfast I had in Zihuatanejo a couple of years ago. YUM. I also like this dish because it’s forgiving on my poorly poached eggs – I can rarely make them pretty enough to serve the silver fox, Eric Ripert. But I’ll keep working on it. In a medium size pan, add olive oil and sautee your chopped onions on high heat until golden brown. Mix your tomato paste and water together and pour into pan. Add your chopped tomatoes, stir until thoroughly mixed in the pan. Cover and lower heat to medium. To poach your eggs – take water to a boil in a large pot. I find it easier to crack an egg into a small bowl and pour them in one at a time (versus putting them directly into the pot of hot water). Pour in your eggs one at a time and boil for 3-4 minutes. Then scoop then out with a slotted spoon and place on a paper towel to dry. While you are poaching your eggs, stir the tomato mixture. The tomatoes should have softened nicely to the consistency of canned crushed tomatoes. Add some salt and pepper to taste. 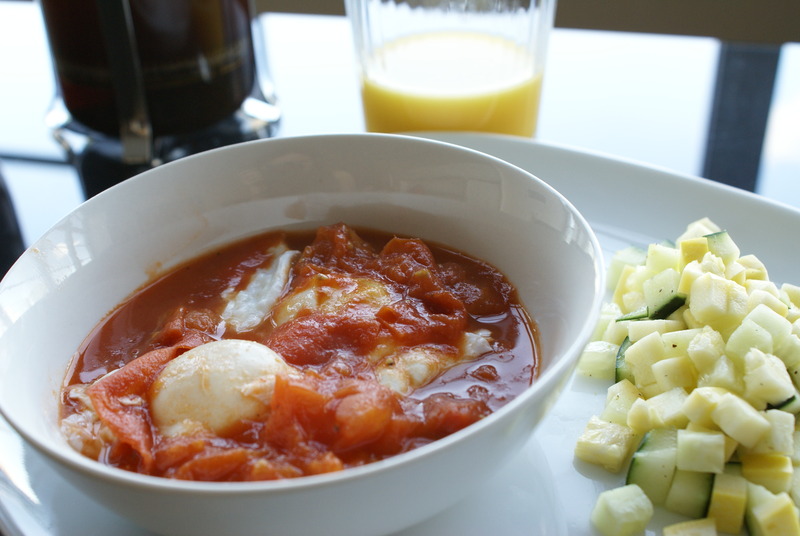 To serve – put your poached eggs in a bowl and then pour your spicy tomato sauce on top. Serve and enjoy! Note: I like to make my tomato sauce extra spicy so the more chili pepper flakes the better! The great thing is that the poached eggs will reduce the heat because the yolk of the egg will dilute the heat a little bit. The morning I made this breakfast, I also had a side of my friend Lukshmi’s Vegetable Medley. My husband thought this dish was delicious by adding that directly into his bowl of tomato sauce. Experiment and enjoy! Just came back from France and still in awe thinking about all of the amazing food I had there, especially in the South of France. I’m not a huge mushroom fan, but my tour guide convinced me to try cepes (similar to porcini mushrooms). They were just heavenly and actually tasted like scallops! Unfortunately, they’re only available in France from what I gather, but since coming back home – I’ve been craving mushrooms. 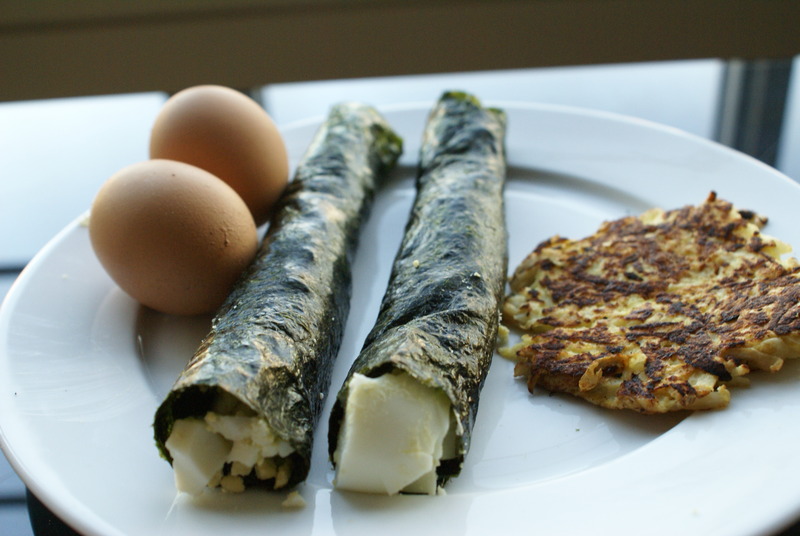 Here’s one way to incorporate mushrooms and a very simple paleo breakfast recipe. Clean and dice your bell pepper. In a hot pan, add a little bit of olive oil and saute your bell pepper and sliced mushrooms for about 5 minutes, evenly stirring until the bell pepper looks soft. 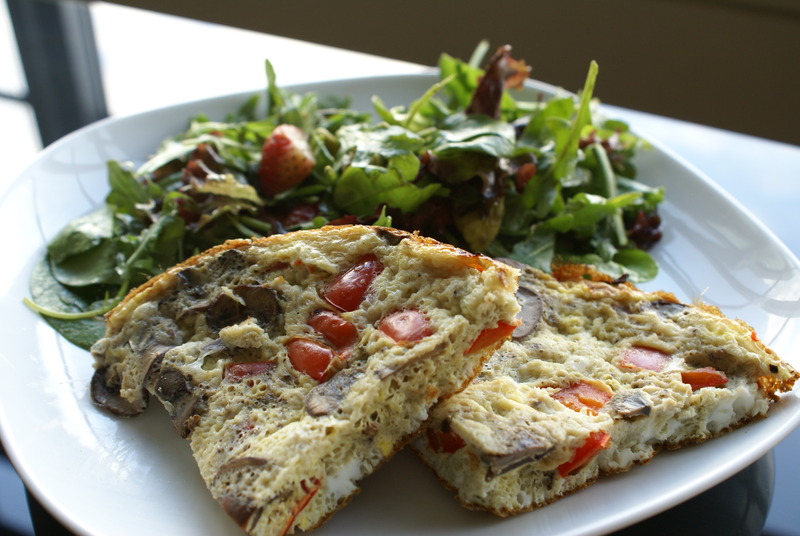 In a mixing bowl, crack open 6 eggs and stir in the sauteed mushrooms and bell peppers. Make sure you have a small/medium sized frying pan that is lightly coated with oil and ready on the stove. Once you’ve thoroughly scrambled the eggs with a fork, pour the mixture in your pan. Cover the eggs and cook on low heat for 10 minutes. The eggs should rise after 5-7 minutes so don’t worry! After 10 minutes (or until desired consistency), take off heat and let cool for a couple of minutes. Cut up your breakfast pizza into pieces and serve. Enjoy! When life gives you zucchini, you make zucchini-ade! Ok fine – bad joke. This week, my local CSA gave me zucchini and I didn’t have time to cook it for a meal but wanted to use it before it spoiled. 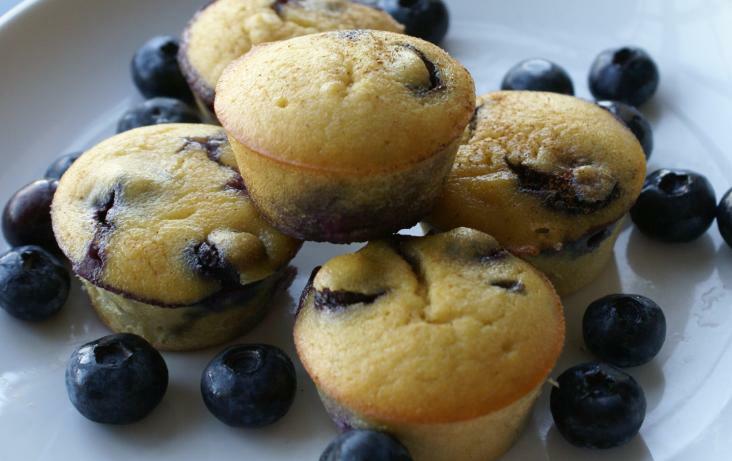 So I figured – when in doubt – make muffins. With this recipe, you can use green zucchini or yellow summer squash, as the two have similar tastes and textures. While I’m still reading about honey and agave sweeteners, I chose not to use either of them for this recipe. Although some argue that honey and agave nectar fall under the paleo-approved category, the jury is still out in my mind. A few articles I’ve read say that agave is really just high frustose syrup in disguise and not truly paleo because of how highly refined it must be before we consume it. And others argue that honey is acceptable in small doses. While I continue to do more reading, I wanted to make muffins that my anti-honey/anti-agave husband would eat so I used dates as a sweetener instead. 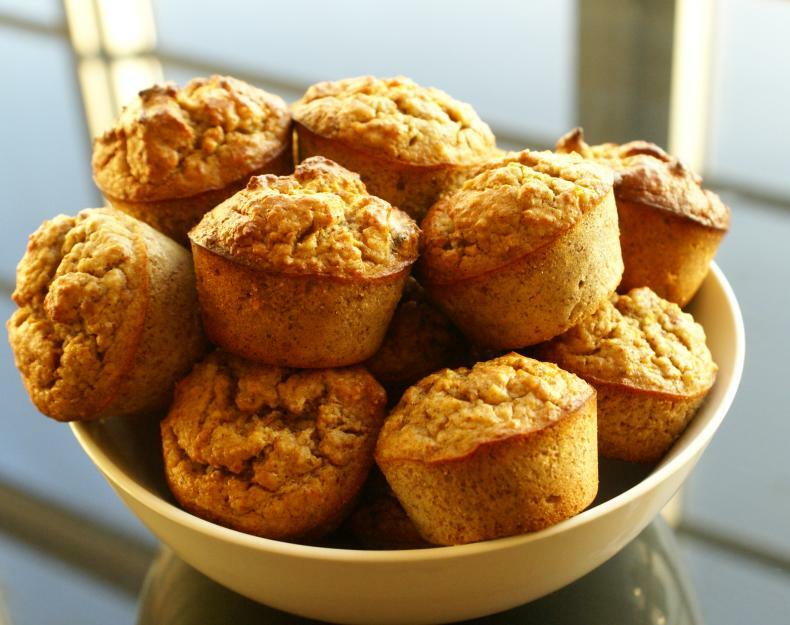 These muffins turned out great (and tastes like moist bran muffins – so don’t expect something very sweet). I’ll experiment with other key ingredients but figured to maximize what’s in my fridge. This recipe would also be great with pureed pumpkin when they’re in season to add that nice natural sweet taste. Stay tuned! Blend the dates until you get a finely chopped mixture. In a large bowl, whisk the egg yolks, dates, cinnamon and apple butter. Once those are evenly mixed, add the zucchini and almond flour and hand mix thoroughly. Set aside. Take your room temperature egg whites and put in a VERY dry bowl. I’m not kidding – not a drop of liquid or oil or yolk because it will interfere with the process of creating air bubbles in the egg whites. The egg whites will expand better at room temperature so you will get bigger volume from them. With a mixer, whisk on high until a soft peak forms and the egg whites are not liquidy. (I tried using a hand whisk but this took forever and I felt it was a harder workout then Fight Gone Bad so to make it easier and faster – use a mixer.) 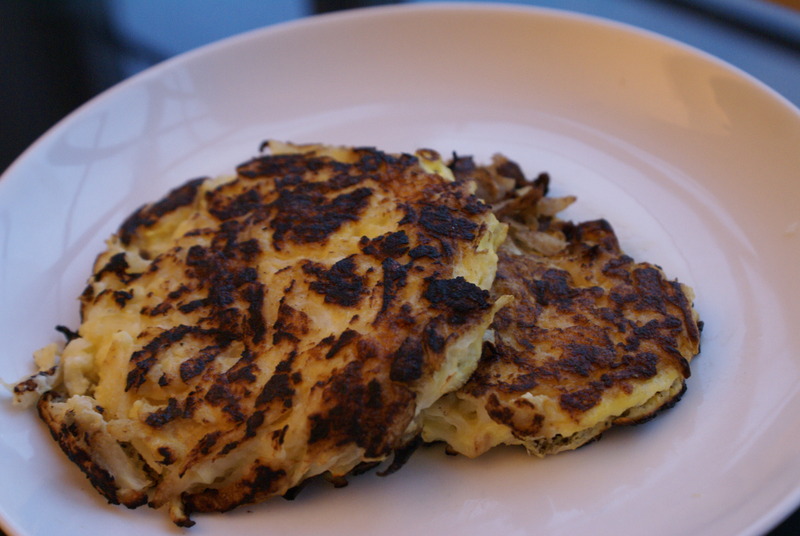 Once you have a Cool Whip type of texture, fold the egg whites into the zucchini/flour batter. I do this slowly – one cup at a time so that the egg foam air bubbles are incorporated throughout the batter. When you are done folding all of the egg whites and batter together, spoon the mixture into mini muffin pans. Bake for 30 minutes (you can always do the toothpick test to see if it comes out clean when you poke it in the center). Serve warm or at room temperature. You might be wondering why separate the egg whites and yolks in the first place. When baking, especially for paleo recipes, you’ll need a leavening agent since baking soda and baking powder are not truly paleo. Beaten egg whites substitute as your leavening agent to make the dough rise slightly. If you didn’t do this, that’s fine too but the muffins will be a bit more dense and less ‘fluffy’. Enjoy! Hello Hump Day. 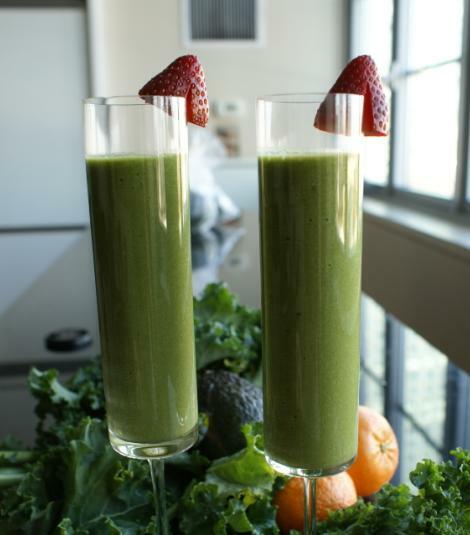 This is a quick and easy breakfast to get you through your Wednesday (or any day for that matter). 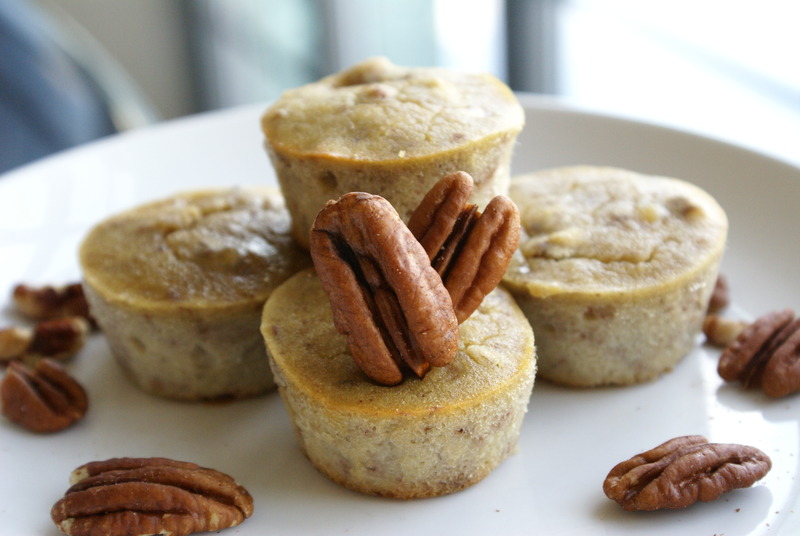 They’re my paleo version of a popover! Spray 4 ramekins with oil spray. Line each ramekin with prosciutto (I find that each cup takes 1.5 prosciutto slices to line the whole ramekin. Feel free to use more or less if you want more prosciutto flavor) and set aside. In a bowl, scramble 6 eggs (I only use 2 yolks because I just wanted a hint of yolk flavor) and set aside. In a pan, take your diced bell pepper and spinach and sautee them. Add a pinch of salt and some pepper. Stir until the spinach is wilted. Put the spinach and bell pepper in the ramekins and press down so that the veggies are tightly in the ramekin. Then pour the scrambled eggs in the ramekins. 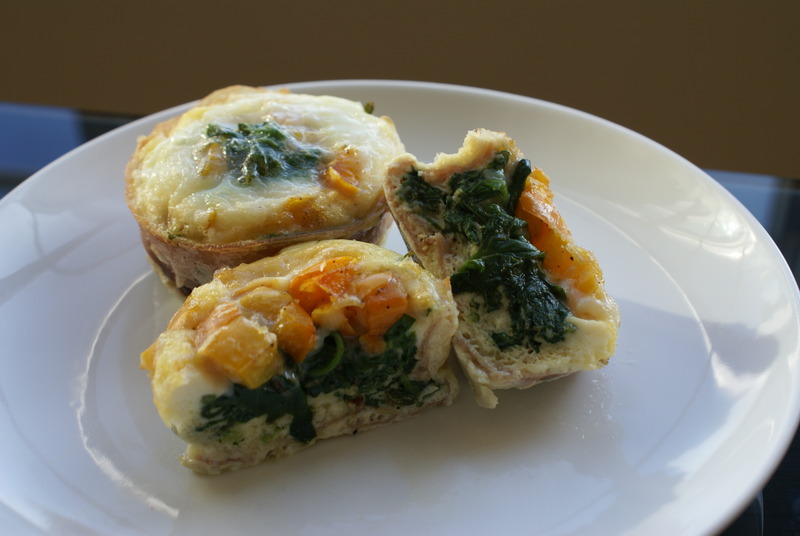 Bake in the oven for 15 minutes or until eggs are the consistency you desire. Pop the egg cups out of the ramekin and enjoy! This is a very flexible recipe. If you want to use ham instead of prociutto – go right ahead. If you choose to use bacon – just make sure to semi-cook it in advance in a skillet (don’t put raw bacon in and don’t fully cook the bacon – it’s all about semi-cooking it). If you want to use different vegetables – have at it. I use yellow bell peppers because I love the sweetness it provides (and had way too many in the fridge). 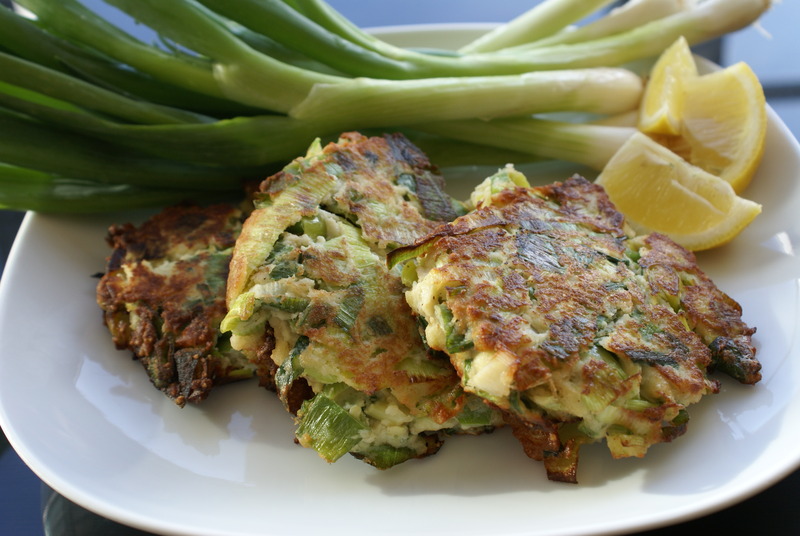 You can try leeks, scallions, tomatoes, etc. Use your leftovers!